You know what? Sometimes, and lean in because I’m going to say this quietly, I like to listen to happy music. Not inane music, not banal music, just happy music, uplifting music and goddamnit, yes, I want music to be beautiful occasionally. It’s what drew me towards post-rock in the first place. And for every hauntingly beautiful track that Saxon Shore produce, or bittersweet slice of 8-minute schadenfreude that Explosions release, there is very little uncomplicated post-rock. Step up Moonlit Sailor and believe me when I say that this is a compliment – you are the closest thing to a pop band that your genre may ever produce. 'Colors In Stereo' is Moonlit Sailor’s third album and their second on independent powerhouse Deep Elm. 2009’s 'So Close to Life' was a bit of an under-the-radar release, but with CiS, Moonlit Sailor could soon be taking up a relatively high position on people’s end of year lists. Opener ‘Kodac Moment’ may sound a bit like Boston’s ‘More than a Feeling’ to begin with, but wait for that drop and I guarantee the first few times you hear it, it will be all you are concentrating on. It strays a little to close into Explosions in the Sky territory towards the end of the track, but the title track which follows it up will pull you back into something uniquely Moonlit Sailor. People who disparage it as a genre often do so on the grounds that it’s too easy to dismiss the songs as all sounding the same – but Moonlit Sailor manage to create an idiomatic sound. Put all the post-rock on my mp3 on shuffle and I’m confident I could pick out Moonlit Sailor’s tracks with ease. It’s also a great way to start for people looking to try the genre, there’s no GY!BE-esque 20 minute soundscapes – the longest track is just over five minutes long. These are post-rock singles – if such a thing could ever exist. 'Freeze Frame Vision' would certainly work on my Top 40 chart – an instant slice of feel-goodery and uplifting musicianship. This really is a wonderful album. 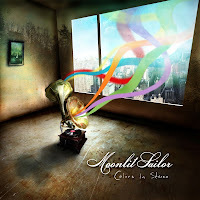 'Colors In Stereo' by Moonlit Sailor is available now on Deep Elm. Moonlit Sailor on Facebook, MySpace, and Twitter.